Some were too complicated for minimum value; others don’t allow any kind of teamwork. A few cost too much and lack of integrations broke the deal for others. The bottom line is that to create the best blog content you can while not wasting your time; you need to be picky with your tool belt. If a carpenter’s only as good as his tools, then a blogger is limited by the apps they use. Luckily, our team has found seven standout examples that have endured. In the right hands (and when used correctly), these productivity apps can save an immeasurable amount of time. They also bring insight that would otherwise be inaccessible – from finding out what’s popular in your niche to keeping you focused and quantifying your success. Natural talent and general writing skill will certainly make up the bulk of your efforts (tools don’t make the perfect blogger, after all) but using these seven blogging tools will make sure that you can be more productive, and that your efforts are getting the maximum return. Grammarly is practically God’s gift to bloggers. If you somehow haven’t heard about it, it’s a productivity app which checks your spelling and grammar as you write. Sounds good, but why not just use a spellchecker? Well, Grammarly has a Chrome extension which allows you to track and check the accuracy of your writing across the web (aside from a few exceptions). Whether you’re typing in Facebook, Google, Slack, or Trello, you never have to worry about being off the mark again. Admittedly, it isn’t entirely foolproof. The most notable exception that Grammarly can’t track is Google Docs. Unfortunately, it’s a little awkward for those in our team who prefer writing in docs before transferring to WordPress. However, once inside WordPress the checks begin, pretty much nullifying any awkwardness caused. Not only that, but you’re given an email every week which rounds up your word count, number of mistakes, and number of unique words used while comparing it to the weekly average for the rest of the Grammarly user base. These stats are perfect for keeping yourself motivated! 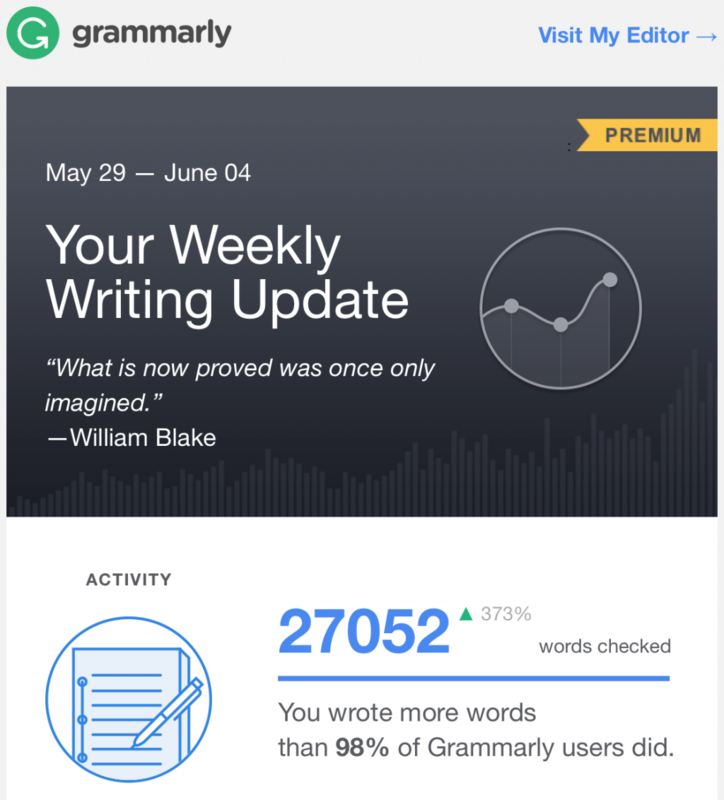 At the end of the week, you can see that you’ve been more active than 99% of Grammarly users, and even share stats with the rest of your team in a mini-competition. Just remember that these stats aren’t exactly accurate (unless I “really” did manage to write 200,000+ words in a week). BuzzSumo is a great tool which allows you to search for the most popular content either on a website or using a keyword. Honestly, I can’t count the number of times this has saved our hide and clued us in on what keywords we need to be targeting. For example, let’s say that you wanted to target the keyword “business processes.” Using Buzzsumo, you could search that keyword and see what the most popular content is, and therefore get an idea of what you could write to get some traction on social media. Alternatively, if you wanted to guest post for a particular site but weren’t sure of the kinds of posts they’re most open to, plug their blog’s URL into Buzzsumo and check out what their top shared articles are. Chances are, pitches with a similar format or topic will go down better than if you pitched something out of the dark. There’s a fundamental distinction here though. BuzzSumo shows you the most shared articles on the site or in the keyword you search for – it doesn’t show you the highest ranking. Remember – just because you shared something a lot does not mean that it will secure your place on the first page of Google and bring in recurring traffic. After the most recent updates to Google Keyword Planner, Ahrefs has taken over as our primary keyword research app. It is now much easier to search keywords by bulk. Ahrefs keyword explorer suggests helpful variations without any extra input on your side – it’s a win-win, especially as our old process made use of 3-4 different apps just to make sure that we generated enough variations to cover all bases. Just plug your keyword idea into the keyword explorer and away you go. Yes, yes, this is a bit of a cheat, but both are absolutely invaluable even though it’s best to only use at a time. Hence I present you with Focus@Will and Spotify. It’s next to impossible to keep up your concentration levels in complete silence reliably – your brain starts to stagnate, and your ideas turn to mush. At the same time, we all know how difficult it is to focus on something when there’s non-stop blaring noise. Focus@Will and Spotify do a great job of filling the dead air with music that’s not sufficiently interesting to be distracting, and engaging enough to frame the task at hand in a better light. The choice between them comes down purely to preference. I, for example, use Spotify because that’s where my personal music collection is (so I already have the paid account). I’ll search for a focused music (or classical) playlist to put on in the background at the beginning of the day, and then get cracking. 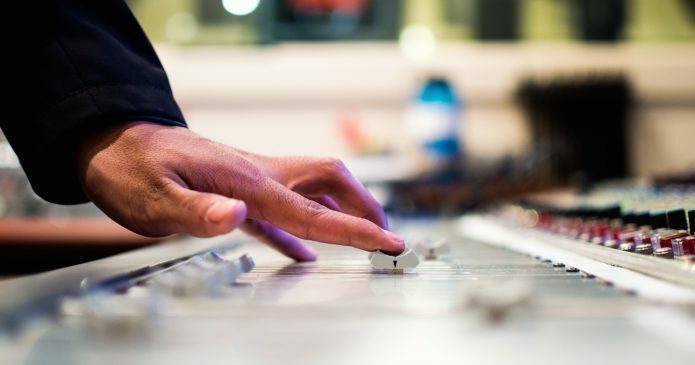 On the other hand, Ben Mulholland prefers to use Focus@Will due to the lack of anything but music designed for focus – he doesn’t like to have the temptation to put on his favorite artists and jam along, and Focus@Will stops that by not providing him with them. Focus@Will also lets you set timers and track your productivity at the end of every session. The app creates a graph over time which is invaluable for showing you your ideal time of day to get things done. Pomello is a simple app which can be boiled down to a time tracker which uses a variation of the Pomodoro Technique. The timer sits at the front of your desktop, lightly ticking away and chiming at the end of each session. Sounds pretty run-of-the-mill, right? 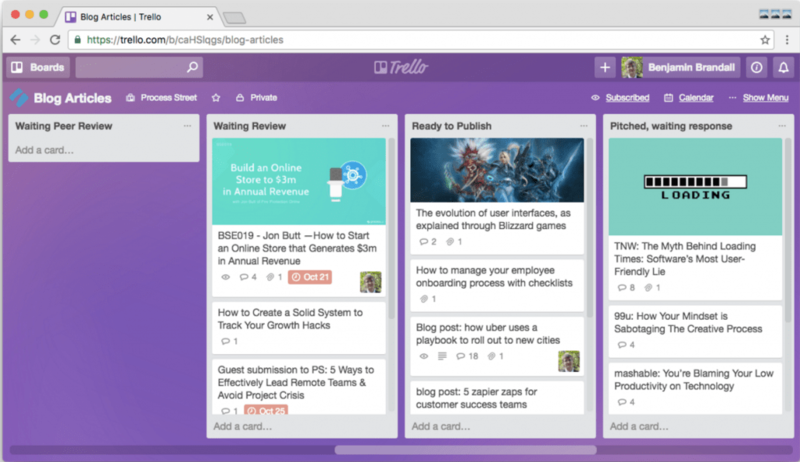 Well, Pomello’s integration with Trello is where things get interesting. 2- When a session is finished (by either the timer running out or you, manually finishing it), you can move the Trello card to different columns from the Pomello interface. Plus, every card you track time on gets a cute tomato on it, which is nice. Trello is a beast of a project management app, and without it, our team would probably have fallen into disarray long ago. It works on a system of boards, columns, and cards. Think of each board as a new cork board on the wall, each column as a group for your tasks, and each card as a task. For example, we have a “Blog Articles” board which is separate from our “Guest Posting” board and all of our personal boards. Then, inside the “Blog Articles”, we have columns for “Ideas”, “Work in Progress”, “Needs Review”, and more. Finally, cards in the columns contain a single post each. So, those are the blogging productivity apps which our team couldn’t live without – what about you? Do you have any others which are vital to your own approach? How do you use them? Guest author Benjamin Brandall is a writer at process.st. He has appeared on TechCrunch, The Next Web and FastCompany.